“Turn it, and turn it, for everything is in it. Reflect on it and grow old and gray with it. Simchat Torah, which means “rejoicing in the Torah,” is an annual love fest demonstrating our abiding affection for the challenging, beautiful, sweet scroll of our stories. We have a special tradition for Simchat Torah at Temple Or Olam. As we roll the Torah back to the beginning, I ask members of our congregation to stand by the column of their choice in the book of Genesis. Then I look. I scan the column for the blessing they have chosen, though they have no idea where it is. To be frank, I don’t either. Nevertheless, some of the letters shine and glisten at me; some words emerge from the parchment. 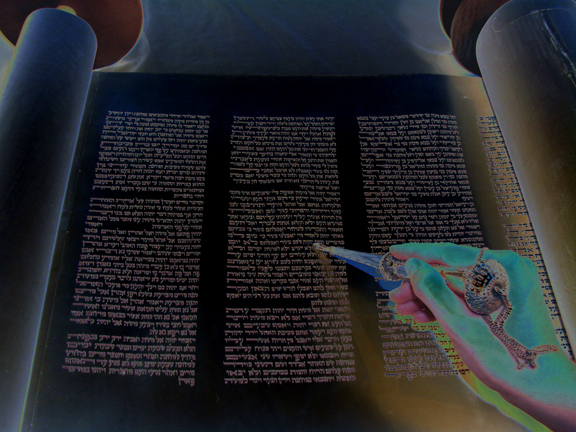 The letters of Torah turn and turn and turn again. I read them: They are telling me something about the soul before me. This past year, a young man in our congregation stood before a dry text indeed. One person begat, the next did the same. I read the series, despairing of message or purpose. Shem begot Arpachshad who begot Shelah who begat Eber. Sixteen verses later, I read the final lines introducing Terah and his sons: Avram, Nahor, and Haran. “What?” asked the young man. I looked up at him. I’ve known him for many years, and watched with increasing joy as he has taken one firm step after another toward this year’s planned beit din. There, I know, three rabbis will surely and joyfully acknowledge what we in our congregation already know (he’s Jewish!). He had chosen the column that introduces Avram’s birth. What did Avram do? Take his heart in his hands and journey towards a different life. What is this young man doing? He is taking his heart in his hands and journeying towards a different life. I went along the table. A young teenage girl stood by a column that began with Sarah’s invitation for everyone to laugh with her, to share her joy at the miracle of Isaac’s birth. This young girl, I know, was born only after many long years of painful waiting and hoping on her parents’ part. “You are a particular blessing,” I say. “Ask your parents to tell you the whole story sometime if they haven’t yet.” Her mom is standing nearby. She laughs. Like Sarah? I moved to a congregant in her seventies who has recently been celebrating her freedom – after many decades – from a certain family member’s demands. She pointed to the scroll, to the passage that describes how Joseph’s family sold him into slavery. “That’s my story,” she says, when I tell her. Torah is so rich I could probably find something in every column for every congregant. Laws of probability, coincidences – you can throw them all at me while I try to explain how magical it feels to discover Torah within the souls of my congregants. Torah is terrible, rich and frightening. It is tender and it is violent. It is often perplexing. It is real. It is human. Maybe this ritual of ours is really about how much I love my congregation. 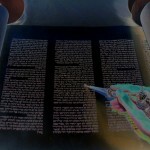 Since I know the people of Temple Or Olam, I can read their stories in the ones before me on the scroll. Sarah and Jacob and Joseph are Stacey and Nick and Susan. The unfurling parchment is ancient and magical. I turn it, and turn it, and turn it again, looking for those I love, those before me, those about me. We are black letters on white parchment, the strokes and lines of a human endeavor, of human striving. Everything is in that. Until my heart breaks, first heart and second heart. What do we long for? For connection. For safety. For love. Why do we sing? Because we hope. Tonight, Yom Kippur begins, and with it, a day when we sing from the midst of our broken hearts. We have accrued dross and weight that is unbearable – how can we throw off the miseries we experienced – much less committed this past year? How can we forgive ourselves, feel we have the right and the chance to try again, to start again, to believe again? Teshuva, return — we pray for it. From the depths we must call out, from the knowledge and the full recognition of our failings. There must be a way to waken, to see the world clearly. We belong to this world. More importantly, the world belongs to us. We are responsible. When has night given way to morning? The rabbis say: When you look into the face of the person who is beside you and you can see that this person is your brother or your sister, then the night has ended. When you have learned that everyone is particular and yet connected to the source of life itself, to the earth we live on, to the people who share it with us, the morning has begun. May I sing the song of my people with commitment and joy. First voice. May I sing the song of humanity with hope. Second voice. May I sing all things divine, for they are everywhere around me, in the faces of those who walk beside me, in the souls of those I do not know, in the footprints of the creatures who hide in the trees. I’ll sing until my heart breaks.